Having more than doubled in numbers over the past 12 months, our dedicated reservations team are here to help you every step of the way, 7 days week. The team are here to look after your accommodation requirements across our 8 London Residences and worldwide with our network of over 15,000 partner apartments. Background: Irish, Moved to London 20 years ago and worked with hotels and serviced apartments in London, namely Guoman and Thistle hotels. Joined Cheval as Head of Revenue in January 2014. Favourite travel destination: New York City, Turkey or Dublin. Favourite restaurant in London: Cannizaro House, Wimbledon. Background: Irish. Worked within the Hotel sector for the past 20 years before moving to Cheval Residences in 2011. Favourite travel destination: Sunny climates, especially the Greek Islands. Favourite is Santorini. Favourite restaurant in London: Roast at Borough Market. Favourite hobby: Alternative therapies, Reiki, aroma therapy and meditation. Favourite place in London: Anywhere by the river. Celebrity crush: Doreen Virtue and Princess Catherine (Kate Middleton). Background: Spanish. Previously worked for Accor, Think Apartments and Ascott in the reservations and revenue departments and joined the Cheval team in March 2014. Background: Romanian. Luxury Hotels and Service Apartments Organisations. Joined Cheval in June 2014. Background: Italian. Previous experience in hotels in Rome and London. Joined the Cheval team in 2014. Background: Spanish/Arabic. Worked as an interpreter in Madrid. Also has worked for 5 years in retail. Joined the Cheval team in January 2015. Favourite travel destination: Anywhere there is sun and a beach, particularly in Spain and Istanbul. Background: Italian. Worked in Italy, UK and Malta in 5 star hotels. Joined the Cheval team in January 2015. Favourite restaurant in London: Her kitchen! Cheval Reservation Services Champion: Cheval Harrington Court and Cheval Partnership Sales. Background: Romanian. Moved to London 4 years ago and has worked with serviced apartments across the capital. Joined the Cheval team in April 2015. Background: Brazilian/Italian. 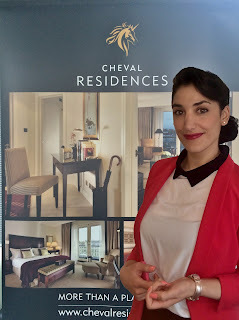 Worked in 5 star hotels across London before joining the Cheval team in April 2015. Favourite restaurant in London: Thai, Chinese and Mongolian are his favourites. Favourite hobby: Socialising, traveling, reading. Favourite place in London: depends on the occasion. Cheval Reservation Services Champion: Cheval Knightsbridge and Cheval Phoenix House. Background: Polish. Joined the Cheval team in July 2015. For any of your accommodation needs, speak to a member of the team on +44 (0)20 7341 7052 or email reservations@chevalresidences.com.